From celebrated short-story writer Tamas Dobozy, Siege 13 is a powerful testament to war's ability to carefully and thoroughly decimate the human spirit. Built around the events of the Soviet Budapest Offensive at the end of World War II and its long shadow, the stories in Siege 13 are full of wit, irony, and dark humor. In a series of linked stories that alternate between the siege itself and a contemporary community of Hungarian émigrés who find refuge in the West, Dobozy utilizes a touch of deadpan humor and a deep sense of humanity to extoll the horrors and absurdity of ordinary people caught in the crosshairs of brutal conflict and its silent aftermath. He was the sort of man you've seen: big and fat in an overcoat beaded with rain, cigar poking from between his jowls, staring at some vision beyond the neon and noise and commuter frenzy of Times Square. Dobozy’s writing has a strong and classic feel to it, and it is apparent that he knows his craft. His stories walk the fine line between the everyday and the fantastical, and the curious actions of his characters echo a loneliness that is sometimes pitiable and other times cruel, but always interesting. (Reviewed by Elena Spagnolie). Though pedestrian prose occasionally softens the impact, these are stories worth telling, and Dobozy is a gifted storyteller in his elegant plotting and touches of surrealism. Colorful and rich in detail and full of life. A superb collection of short stories that revisits two of the deadliest months in Hungarian history. The book tells the stories of those who hid, those who fought, those who betrayed, those who escaped and those who died, and how the effects of the siege still linger, three-quarters of a century later.... Siege 13 is one of the best books of the year. From the dark cityscapes of besieged Hungary to the émigré cafés of contemporary North America, Siege 13 spans continents and decades, and in doing so illustrates once again that old maxim: the short story can be both as broad and as deep as a novel. At times gently humorous, at times quietly wise, Dobozy's thirteen stories dazzle with their psychological nuance and brilliant attention to detail. These stories are never less than breathtaking. Siege 13, Tamas Dobozy's new collection of short stories, shows us once again that he is an excellent storyteller, one of the few who keep the art of writing good short fiction alive. His stories are usually about Hungarians living outside of Hungary, lost forever in the labyrinth built on the thin border between memories and reality, past and present, words and silence. Like Nabokov, Tamas Dobozy combines the best elements of European and American storytelling, creating a fictional world of his own. The stories in Tamas Dobozy's collection, Siege 13, look at some of the emotional and psychological consequences of the Budapest Offensive, one of the longest and deadliest military campaigns of World War II. 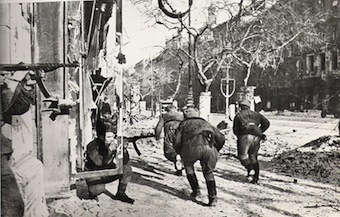 Beginning in the autumn of 1944, the Budapest Offensive lasted though February 13, 1945. Budapest was officially surrounded on December 29, 1944, in what became known as the "Siege of Budapest". The whole campaign caused immeasurable destruction and hardship.